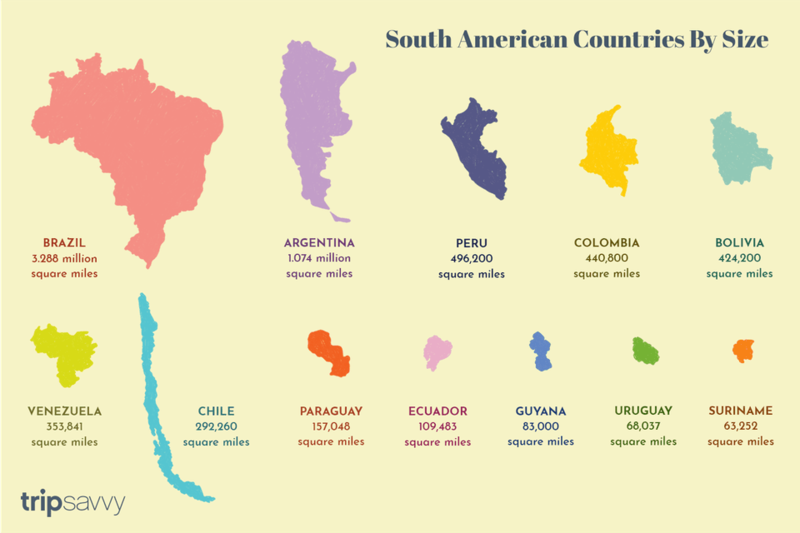 South America is a continent of great variety, and that also goes for its countries, with the largest occupying a land area close to the size of the entire United States including Alaska, and the smallest country on the continent around the size of Wisconsin. These nations are diverse and quite different, and from huge mountain ranges to amazing coastlines and wonderful scenery, there are plenty of things that make each of the South American nations worth exploring. This massive country is by far the largest in South America, and it is also the only country on the continent where Portuguese is the predominant language, as opposed to Spanish which is spoken in most other South American nations. The country has two massive cities with over ten million people each, including the business center of Sao Paulo and the famous beach city of Rio de Janeiro, while the large rainforest of the Amazon means there are some very remote areas too. With a territory that covers a large part of the east coast of South America, Argentina has a long history of European influence with today's population almost entirely of European descent. Famous for its football and for being one of the strongest economies in the region, Argentina is the largest Spanish-speaking country in the world by territory. Peru is the third largest of the countries in the region, is roughly twice the size of Texas, and has a similar population to the state, meaning Peru is generally quite low in terms of population density. With parts of the country in the Andes and another region covered by the Amazon forest, this is not necessarily a surprise. As the second most densely populated country on the continent, Colombia has five cities with over a million residents. It is also one of the few countries that have both a Pacific and Caribbean coastline and is the only South American country to face both oceans. The least densely populated country on the continent with over a million residents, Bolivia is a landlocked nation that is known for its high altitude terrain, and is famous for being home to the highest de facto capital city in the world, La Paz. Around twice the size of California, Venezuela is a country that has a long Caribbean coastline, as well as being home to a portion of the Amazon in the south of the country, and a part of the Andes range. The capital city, Caracas, has just over two million residents, and an economy based largely on oil production. This long strip of land on the east coast of the continent is one of the longest north to south countries in the world, but never reaches over 220 miles from east to west. With a total territory a little larger than Texas, its population is much lower, with the majority of people living in the central area of the country, and the southern part of Chile being very sparsely populated. The second of South America's landlocked countries is slightly smaller than California, and is also relatively sparsely populated. One of the interesting aspects of the country is that it is home to the largest hydroelectric dam on the continent, near the Iguazu Falls, and this electricity plant produces far more electricity than the country needs, exporting most of the energy to Brazil. Having once been a key part of the Inca Empire, Ecuador is a small country with a Pacific coastline that is becoming more popular in terms of international tourism. It is the most densely populated country on the continent, and because the Galapagos Islands are an Ecuadorean territory, it is considered to be a megadiverse country in terms of its natural species. This small sparsely populated country faces on to the Caribbean Sea in the north of the continent and is the only country where English is the national language. The Kaieteur Falls are fairly rarely visited by tourists, but they are the largest single drop waterfall in the world, where the water falls for 226 meters from the top to the bottom. A small country nestled between Argentina and Brazil, Uruguay is quite densely populated and has a territory roughly the size of Missouri. Famous for their agriculture, Uruguayans are noted for eating the highest amount of beef per capita anywhere in the world. A little larger than the state of Georgia, this country also faces the Caribbean, and due to it being mainly covered in forest, most of the small population live on the coast. With around half a million people, the vast majority of people live in the capital Paramaribo.